The simple mention of vanilla pudding evokes childhood memories of the smooth vanilla treat that mom used to make or the plastic pack stuffed into a lunch box geared at prompting an after lunch smile. Instant vanilla pudding is a staple of moms everywhere. 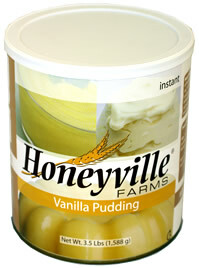 Honeyville's Instant Vanilla Pudding is a jumbo-sized adaptation of the small, store-bought, boxes of pudding. Each large #10 can contains 56 servings of Vanilla Pudding. That's about 14 average size boxes of store bought vanilla pudding. It's a great value that will go a long way. Try some today! Basic Instructions: Add 1 cup of Vanilla Pudding mix into bowl. Add 3 cups of cold milk. Mix with whisk until mix starts to thicken. Place in refrigerator. Pudding will be soft-set and ready to eat within 5 minutes. Sweet Treats Vanilla Pudding: Mix 2 cups cold milk and 3/4 cup Vanilla Pudding mix in bowl with whisk. Refrigerate for 5 minutes. Spoon into serving dishes. Add a sprinkling of your favorite Honeyville Freeze Dried Fruit as a topping. Vanilla Pudding Pie: Prepare pudding as directed, reducing milk to 2 1/2 cups. Pour, at once, into Graham Cracker Pie Crust. Refrigerate at least 1 hour, or until set. Top with whipped cream. Enjoy!